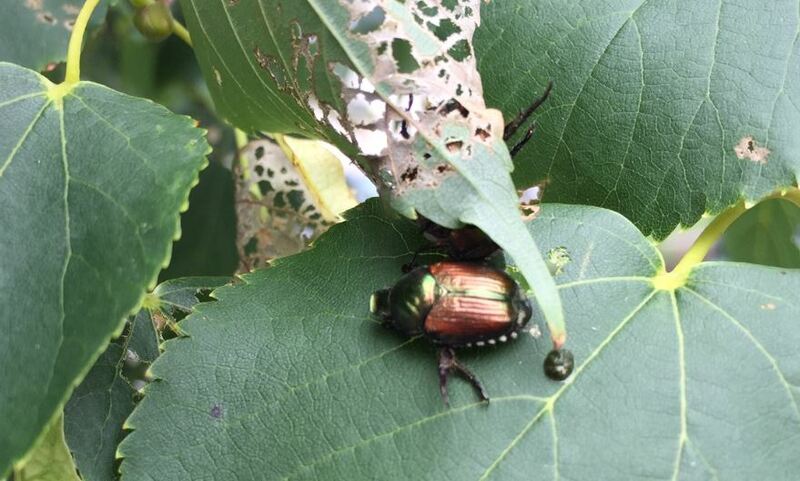 If you’ve spent any time outside in the past couple of weeks, you’ve likely seen numerous beetles flying about; they have metallic green bodies, coppery wings, and little white tufts of hair on the side. They are Japanese beetles, and they are a force to be reckoned with. They have been in the U.S. for almost 100 years, but are just now making their way to the Midwest, as winters haven’t been cold enough to control the larvae/grubs, which will damage lawns as they eat the roots. They become adults in June and July and start eating—more than 300 species of plants. You’ve probably noticed the damage on Linden trees—they start at the top and turn the leaves into brown lace. Unlike many insects, they lay eggs in lawns daily for over a month, creating more larvae to eat the roots and more beetles to feast upon plants next year. Your first instinct is probably to break out the pesticide but hold that thought. The only pesticides that work require special handling, cause damage to humans and the environment when improperly used, and also kill beneficial insects (including pollinators), and are unsafe for edible plants, pets, wildlife, and waterways. Get rid of the adults. Don’t use pheromone traps; while effective, they will attract more bugs to your yard, as Japanese Beetles can fly 5 miles(!) when motivated. Don’t smash or step on them, that also releases the pheromones and will attract more. Brush them off and drop them into water with just a bit of dish soap. They die, no muss no fuss, and you stop the damage from the adults now and the eggs they would lay in the future. Apply milky spore. Grubs eat it, die, and release more spores which infect more grubs. It takes 3-5 years to be effective, but provides the best longer-term solution as it becomes established in the soil. Apply parasitic nematodes (Heterorhabditis bacteriophora) to your lawn to eat the larvae. They are effective if properly watered in and the ground kept moist. Apply Bacillus thuringiensis to specifically kill grubs. Use a product containing azadirachtin, the insecticidal ingredient found in neem oil. This concentrated spray is approved for organic use and best of all, it’s non-toxic to honey bees and many other beneficial insects. Attract birds. Robins, bluebirds, and others will eat the grubs. Don’t overwater, grubs do better when the ground is moist. Plant less grass. You decrease maintenance time and expense, and they have less to eat.